Below you will find the entire lineup of followspots available for rental at Arc Light Efx. We carry an extensive array of Strong xenon followspots as well as the acclaimed Truss Trouper H.M.I. fixtures. Power distribution packages are available complete with cam, twist-lock cable, distro box, adapters, and buck/boost transformers. Need a color correction package? Our Pacific Gel division can provide a complete assortment of ND, CTO, color and more. Pacific Gel has been in business for more than ten years leading the way in custom gel scrolls, cuts and resales. 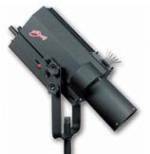 Each followspot comes complete with fixture, bulb, power supply, stand, and yoke. Additional accessories are available upon request. Followspots are available on a 1 day per week rental period. 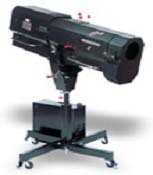 2,000 Watt xenon followspot for long throw applications.